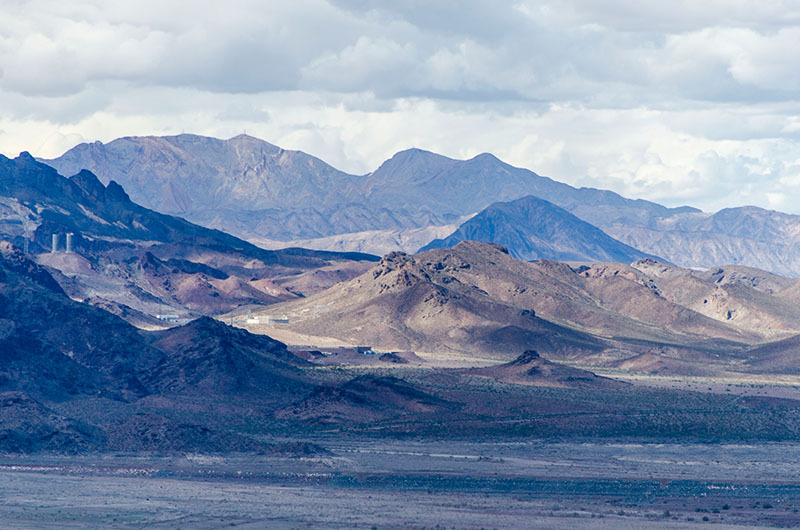 After Los Angeles, we drove into the desert of Nevada and had an over-night stop in Las Vegas – more about this crazy city in a later post. 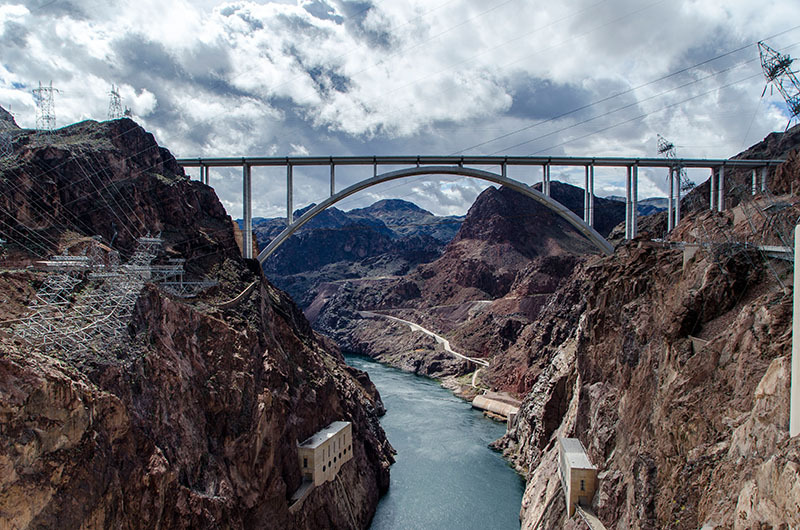 On the next morning, we left Las Vegas and had our first stop at about 30 miles (48 km) southeast from there – at the Hoover Dam, a concrete arch-gravity dam in the Black Canyon of the Colorado River. 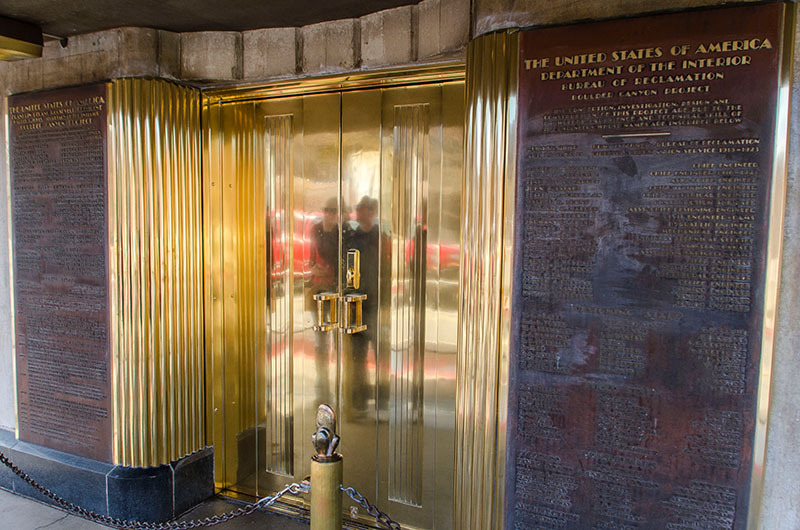 It was constructed between 1931 and 1936 during the Great Depression and was dedicated in September 1935 by President Franklin D. Roosevelt, although it’s named after President Herbert Hoover. 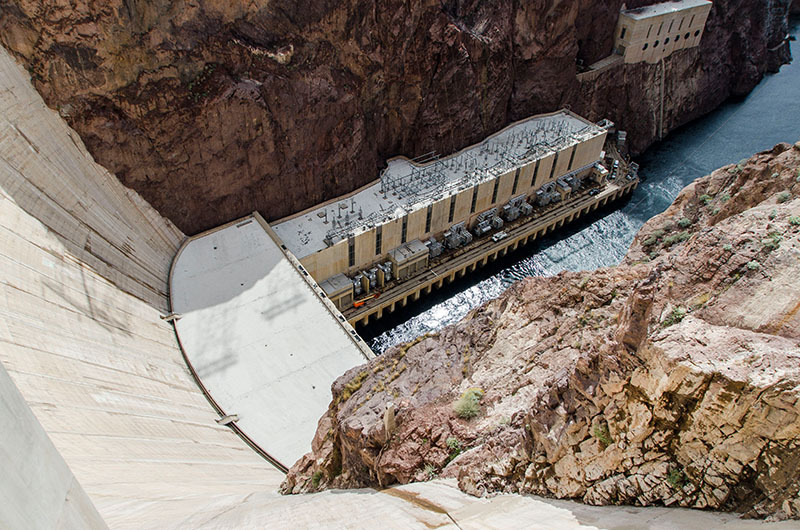 Since about 1900 the Black Canyon had been investigated for its potential to support a dam that could control floods and produce hydroelectric power. Finally in 1928, the Congress authorized the project and the difficult construction – which cost over one hundert lives – began by a consortium called Six Companies, Inc. 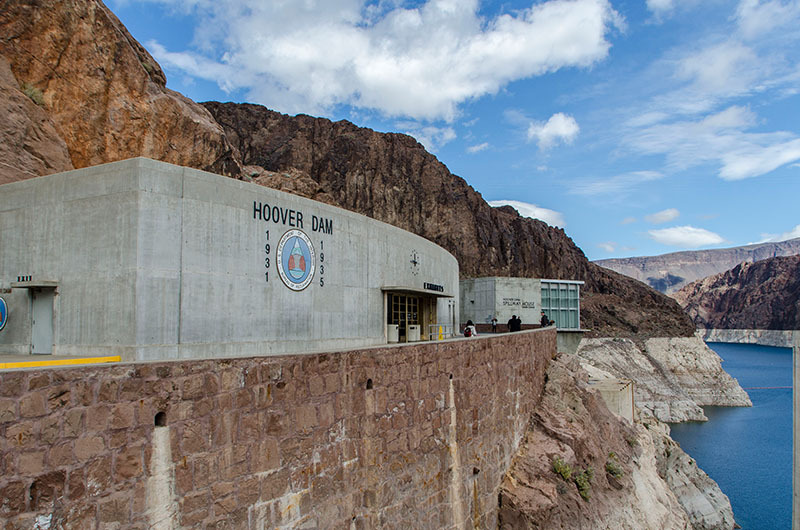 If you want to enter the Hoover Dam, you have to drive through a security control first. 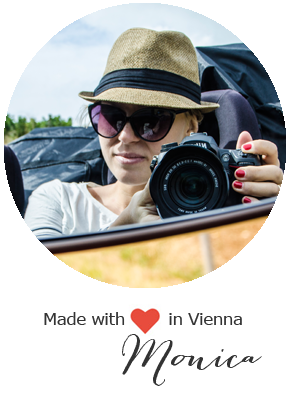 Of course, our (rental) car was picked and our car and luggage were checked in details. 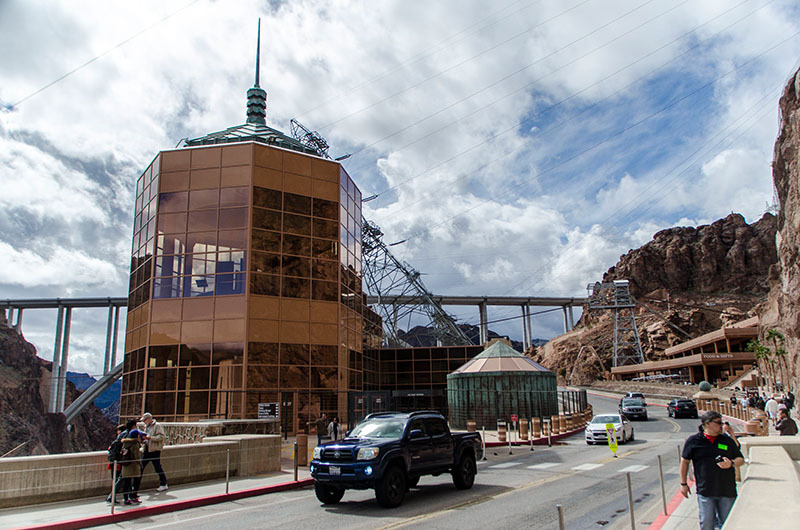 Afterwards, you have two parking possibilities: One is next to the visitor center ($10 parking fee), the other is over the dam a little on the hill – for free and with an amazing view. 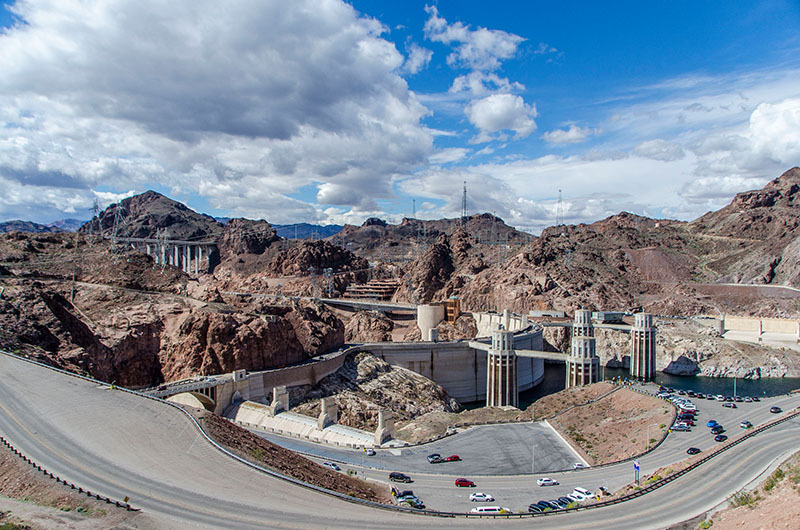 From above, the dam looks very futuristic and could also be a science-fiction movie-set. 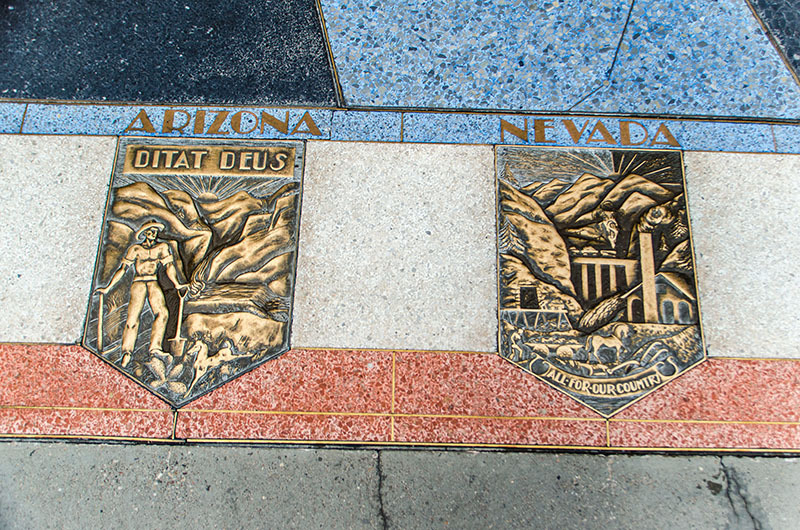 The Hoover Dam also marks the border between Nevada and Arizona – two states which are in different time zones which means that there is an 1-hour time shift from one side to the other of the dam. 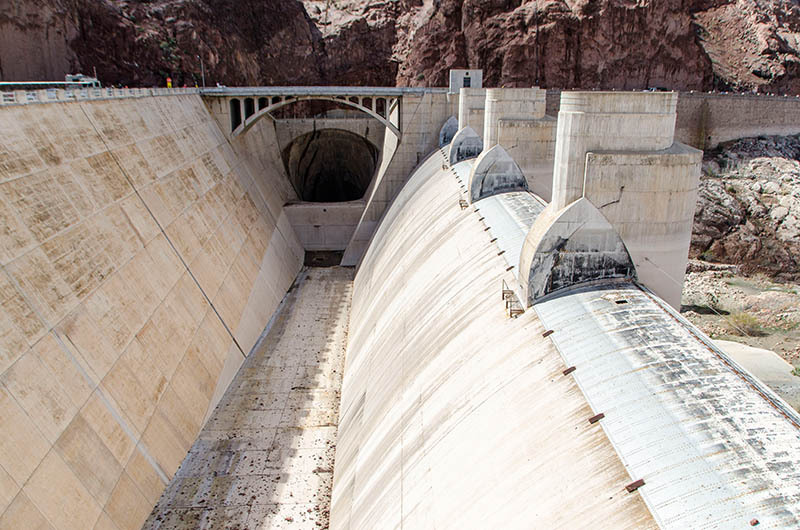 At a closer look, the dam didn’t look as plain and puristic as it did from first sight. 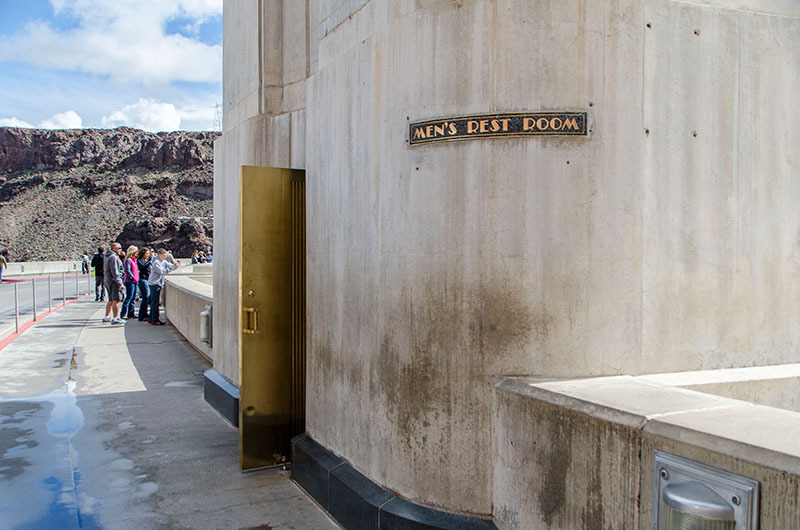 The whole dam is covered in an elegant Art Deco style with golden doors, many ornaments and decorations on the walls and floors. 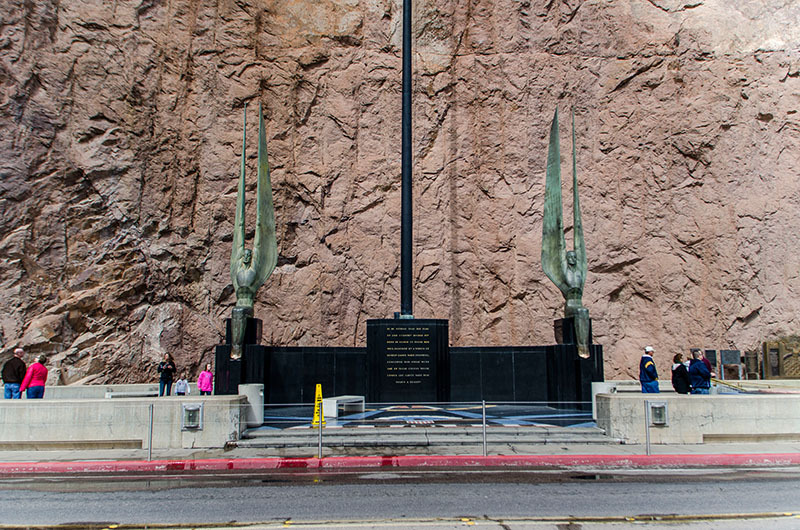 On the Nevada side of the dam, there you can find the plaza with two 30 feet (9.1 m) high bronze figures called “Winged Figures of the Republic”. Each of those figures were formed in a continuous pour. To put them in position without marring their surfaces, they were placed on ice and guided into position as the ice melted. 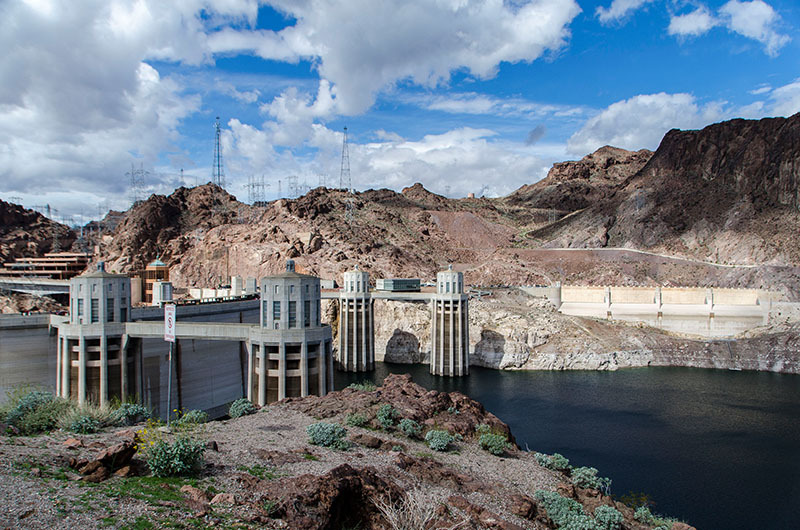 The Hoover Dam also includes Lake Mead, the largest reservoir in the United States by volume. 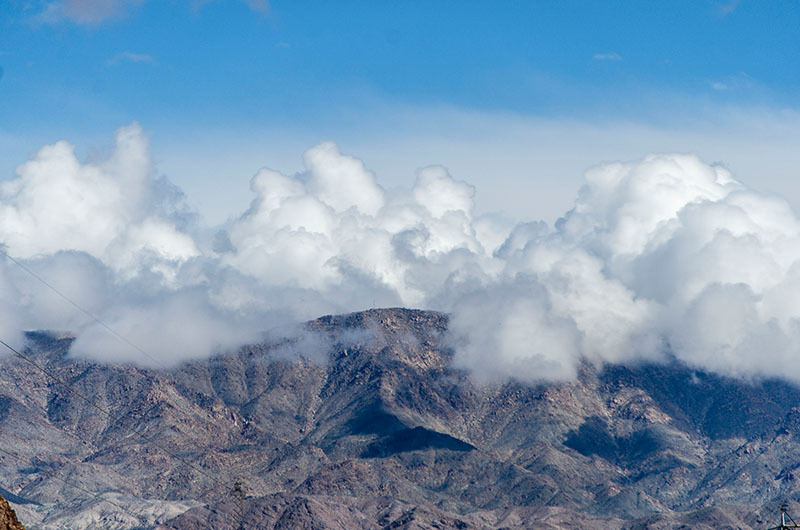 Water from the lakes serves 8 million people in Arizona, Nevada and California. 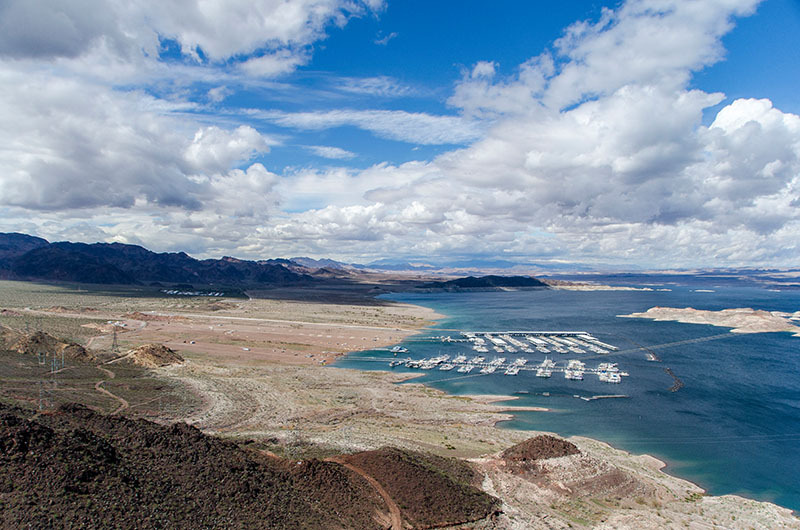 And as already mentioned our trip to Yosemite, the water level of Lake Mead was alarming low. 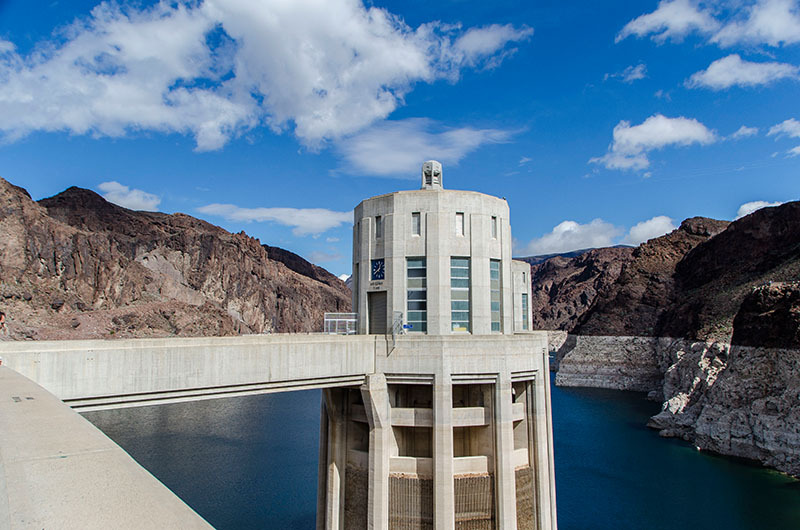 But not only Lake Mead left a scaring impression on the environmental situation. 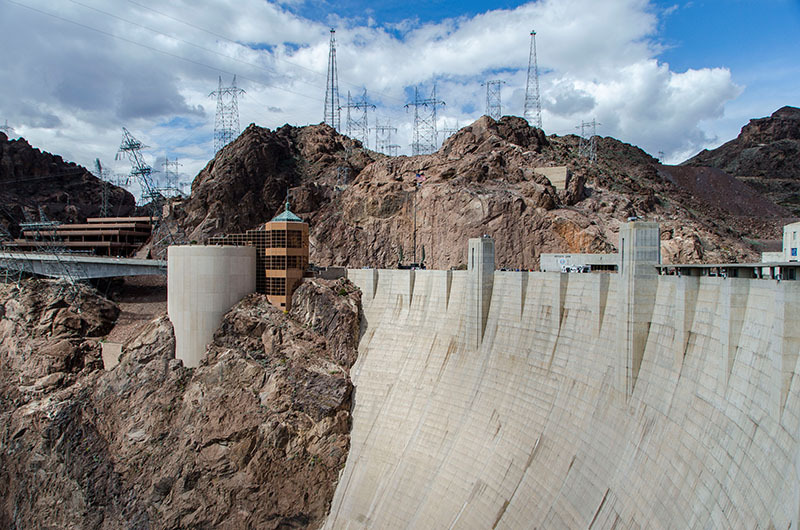 The dam eliminated the natural flooding of the Colorado River, which has impact of many species. The construction of the dam devastated the populations of native fish in the river and some species are listed as endangered.